Decreased vision in right eye, without pain. A 36-year old female presented with poor vision secondary to a low intraocular pressure (IOP) in her right eye. She had been diagnosed with bilateral idiopathic anterior uveitis in both eyes at age 27 and subsequently developed secondary glaucoma, either due to chronic intraocular steroid use or chronic uveitis, in the right eye (OD) worse than in the left eye (OS). She underwent bilateral trabeculectomies with mitomycin C (MMC) in 2009 and cataract extraction with intraocular lens implantation in 2010 OD and 2011 OS. She was lost to follow up until 2015 when she was found to have an over-filtering bleb with visual acuity (VA) of 20/70 and an IOP of 3 mmHg OD with hypotony maculopathy. She underwent blood patching with temporary improvement in the maculopathy, and another blood patching two months later in the right eye (8/2015 and 10/2015). She was lost to follow-up for another ten months and, in 2016, was urgently referred back with visual acuity in the right eye of 20/60 and IOP of 2 mmHg. Figure 1: Humphrey Visual Field (HVF) of the right eye. 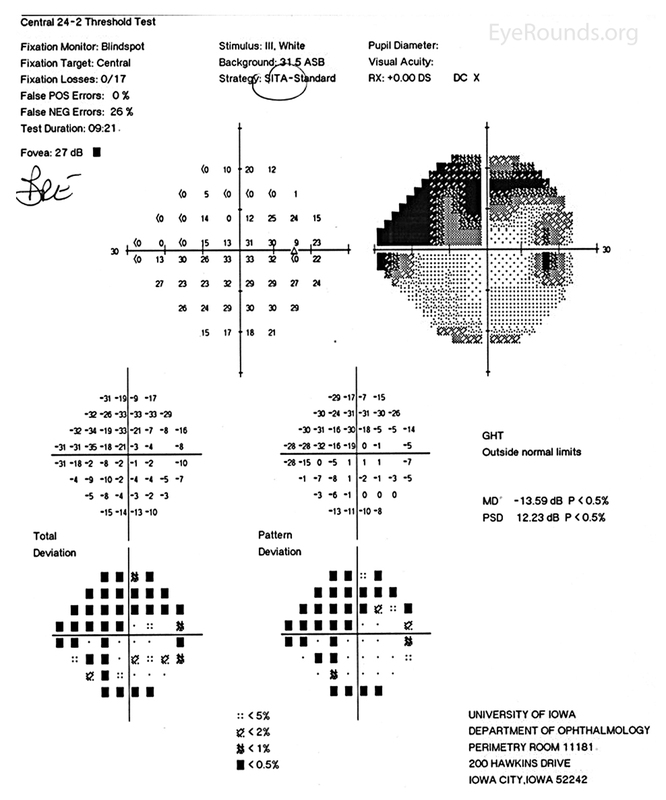 This is a 24-2 visual field commonly used in the screening and monitoring of glaucoma patients. This patient's visual field represents severe stage glaucoma. There are both inferior and superior field defects and these defects approach central vision. Figure 2: Color fundus photo of the right eye, centered over the optic nerve head. In this photo, the optic nerve appearance is consistent with glaucoma as the cup to disc ratio is increased due to loss of the nerve tissue. The supporting history and other studies support these changes as attributable to glaucoma as compared to other etiologies of enlarged cup to disc ratio. 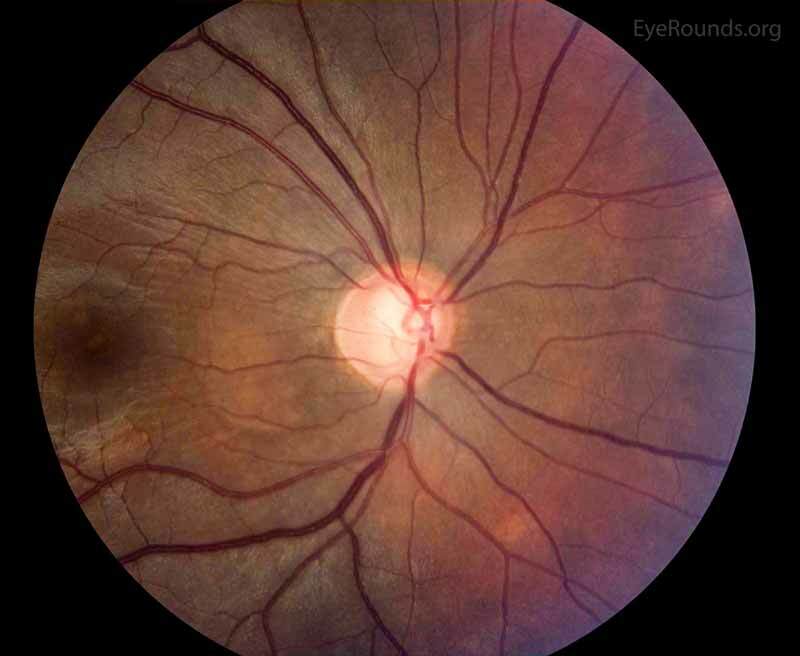 Figure 3: Color fundus photo of the right eye, centered over the macula. In this photo, the wrinkling and striation of the macula is present from the hypotony maculopathy. Due to the low intraocular pressure, folds form in the chorioretinal tissue. There are fine folds radiating out from the fovea and more prominent folds radiating from the optic disc. The patient underwent blood patching in the right eye to help raise the IOP in 8/2015, which improved her vision from 20/70 to 20/20 and her IOP from 3 mmHg to 8 mmHg. This improvement was short-lived and blood patching was performed again in 10/2015. Due to insurance and transportation issues, the next evaluation did not occur until 8/2016. At that time the IOP was 2 mmHg in her right eye and she had 20/60 vision. 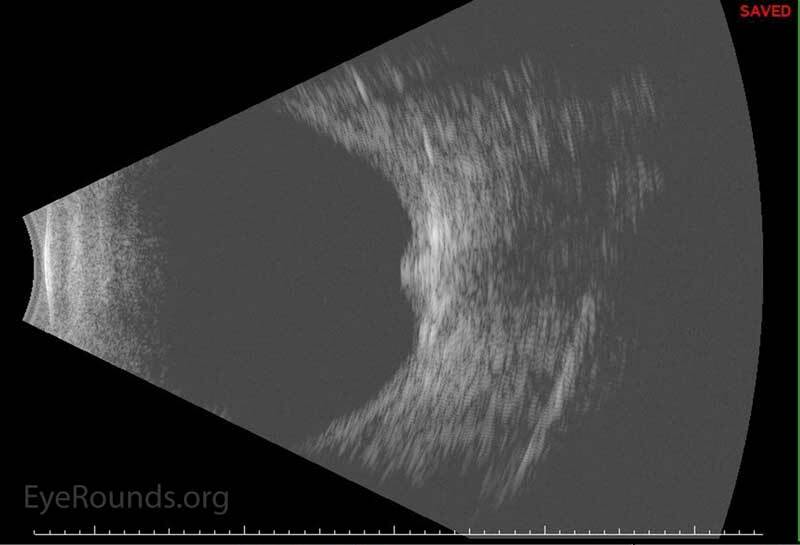 The patient's macular optical coherence tomography (OCT) at the time showed hypotony maculopathy (Image 4). She underwent surgery in 9/2016. During the surgery, the bleb was removed and the trabeculectomy site closed with a scleral patch graft. At the same time an Ahmed seton was inserted and covered with a corneal patch graft. Figure 4: OCT showing hypotony maculopathy. There is a wrinkled appearance to all of the chorioretinal layers. Modern filtration surgery techniques have reduced the incidence of hypotony, but rates of post operative hypotony still occur in up to 38% of cases. The risk increases in cases using antifibrotic agents like mitomycin C. Meta-analysis suggests an increased risk of hypotony due to trabeculectomies performed without releasable sutures (RR 4.04) as compared to with releasable sutures (RR 2.57). Hypotony can occur early (within two weeks of surgery), or late (after two weeks). In one study, late hypotony after primary trabeculectomy with mitomycin C and laser suture lysis occurred in 42.2% of eyes after two years of follow up. Risk factors associated with hypotony include younger age, male gender, myopia, and systemic illness. The principles underlying hypotony can be divided into aqueous underproduction, increased aqueous outflow, or combination of the two. Inflammation both decreases aqueous production in the ciliary body and increases outflow by increasing uveoscleral tract permeability. Inflammation is not the only cause of decreased aqueous production, however. Aqueous suppressant medications (such as beta-adrenergic antagonists), disruption of the ciliary epithelium, or proliferative downgrowth over the ciliary body can all decrease aqueous production. Hypotony is not always symptomatic and no IOP cutoff exists below which intervention is indicated. One study found 40% of eyes with low IOP lacked any associated physical signs and two-thirds of eyes maintained visual acuity within two lines of baseline acuity. Individual eyes have a wide range of sensitivity to hypotony. Even patients with a bleb-leak often remain asymptomatic, making objective signs critically important. However, when symptoms do develop, visual acuity is often affected. The severity of this decline in visual acuity is quite variable, but will usually improve as the IOP improves. The cornea can develop Descemet folds, astigmatism, and edema. The cornea can also decompensate in shallow anterior chambers and lead to cataract formation if contact develops between the lens and cornea. Distinguishing iridocorneal touch from cornea-lenticular touch is important as cornea-lenticular touch can cause deterioration of both the cornea and lens. 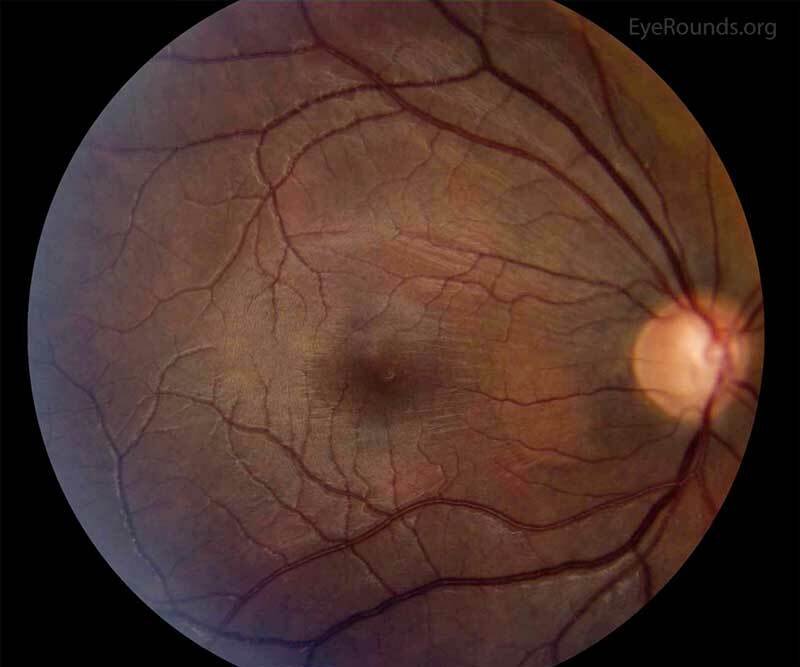 Serous choroidal detachments may be visible on exam, but are usually asymptomatic. These serous choroidal detachments may enlarge significantly to the point of retina-to-retina contact, known as "kissing choroidals. "[3, 7] (see Related EyeRounds atlas page) However, sudden vision loss and severe, throbbing pain can occur due to breakage of vessels, leading to suprachoroidal hemorrhage. This presence of hemorrhage carries a worse prognosis as compared to serous detachments. Choroidal detachments can be distinguished from retinal detachments as their convex cross sectional appearance extends to the ciliary body, instead of stopping at the ora serrata like a retinal detachment. The optic nerve head may become edematous due to constriction of axons. With this, the optic nerve head can be mistaken to have a decreased cup to disc ratio as this edema leads to pseudo-reversal of cupping. The macula may have tortuous vasculature and folds in the chorioretinal tissue. In hypotony maculopathy, there are fine retinal folds radiating out from the fovea and branching chorioretinal folds radiating from the optic disc. Slit lamp and dilated fundus examination are important mainstays of the evaluation of hypotony. IOP should be checked by a reliable and accurate method, like Goldmann applanation tonometry. However, false elevations of IOP can occur when the lens contacts the cornea during applanation. Slit lamp examination should include evaluation of trabeculectomy blebs. Seidel testing must be done to test for a leak. However, false negative results occur in slow or intermittent leaks and pressing on the globe may be necessary. Gonioscopy is utilized to examine for a cyclodialysis cleft and if unsuccessful, other methods like anterior segment OCT or ultrasound biomicroscopy should be utilized. There are many approaches to the treatment of hypotony and should be tailored to the etiology. In general, it is difficult to increase the IOP. Medications like sodium azide, sodium nitroprusside, cation ionophores, and parasympathetic medications increase IOP, but are too toxic for clinical use. Topical corticosteroids can be introduced, especially in inflammatory etiologies to increase both production of aqueous and create a steroid-induced IOP increase. Atropine can also be used to deepen the anterior chamber and reduce the contact between the iris and cornea. Overfiltering blebs can be treated with pressure patches, wound revision, blood injection, trichloroacetic acid, stopping corticosteroids, or tightening the scleral flap with sutures. The trabeculectomy site can also be revised with bleb excision and placement of a full thickness scleral patch graft. In case reports, this approach achieved rapid return of visual acuity, reformation of the filtering bleb, and IOP control without medication. A cyclodialysis cleft can sometimes be closed with laser treatment or can be surgically sutured. [1, 6] Retinal detachments should be repaired surgically. Ciliochoroidal effusions will often spontaneously resolve as the IOP improves, but can be treated with corticosteroids and anticholinergic eye drops. If the ciliochoroidal effusion is large or touching the midline, surgical drainage should be considered. Bowling B. Acquired macular disorders. In Bowling B (eds), Kanski's Clinical Ophthalmology, 8th edition. Philadelphia. Elsevier; 2016; Chapter 14, p. 579-639. Thygesen J. Late Hypotony. In Shaarawy TM, Sherwood MB, Hitchings RA, Cowston JG (eds), Glaucoma, 2nd edition. Philadelphia: Elsevier Saunders; 2015; Chapter 88, p. 863-881. Guthoff RF, Labriola LT, Stachs O. Diagnostic ophthalmic ultrasound. In Ryan SJ, Sadda SR (eds), Retina, 5th edition. Philadelphia: Elsevier Saunders; 2013; Chapter 9, p. 227-284.